Importance: This is a good way to protect yourself. There are other ways that are easier. AdGuard is an ad-blocking service that works very differently from what I was used to. It has a free browser extension, but I do not recommend that. The interesting option is their paid service. For two devices it costs $25 for the first year, and then $20/yr for renewals. It is less for just a single Windows, Mac, iOS, or Android device protection. I purchased it for my Windows computer and my Android tablet. There is a two week free trial period. Removed all other ad blockers, and privacy guards. Disabled all my browser pop-up protection blocking. So, I only used AdGuard for advertising and pop-up blocking. A big thumbs up. I like it very much and intend to remain using AdGuard on my computer and tablet, disabling all other malvertising protection. I believe I'm getting better protection and it is easier to control. Ad blocking, phishing and malware site protection. 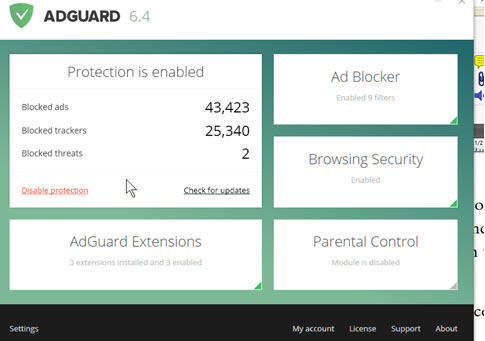 Besides blocking ads, AdGuard also protects you from malware sites. They have categorized over 15 million sites and block 1.5 million. It blocked my access to two sites I tried to visit which had bad reputations. It also has site information available if you are at a new site and wonder whether it is trustworthy. They check with WOT, Yandex Safe Browsing, and Google Safe Browsing. Parental Controls. I haven't used this, you can implement some protection for children using your computer. Cost. It may seem that cost is a negative, but by funding themselves in this way, they provide tech support and make a deeper more configurable product. They have a staff that continually improves the product and can answer questions. Consolidation. One place for all browsers. One place for all protection. By having the program running all the time, you are protected regardless of which browser you use. If a site requires that you use a browser you don't normally use, you're still protected. This also means that there is only one place you need to go to turn off protection if a site isn't working. Here's how I setup AdGuard, so this is what I'm recommending. User Filter: This starts empty, but if I add something I want blocked or whitelisted, then it'll be here. AdGuard Base Filter and Easy List filter. These block most ads. AdGuard Tracking Protection Filter. This blocks most trackers. I add none of the other anti-tracking lists. AdGuard Social media filter: This stops the social media trackers like "like buttons". AdGuard Annoyance filter: This blocks notification notices, pop-ups, third party widgets and cookie notices. AdGuard Warning removal list. This removes the pop-ups telling you to remove your ad-blocker! Malware Domains. This is the 1.5 million known bad sites. Browsing Security: I enable all four of these options. Extensions: I've enabled all three basic extensions. Network: Should AdGuard filter the traffic that comes to you? Since most traffic is now using HTTPS: (secure connections), to be useful this requires that they install a certificate in your computer and intercept your traffic. It gives you added protection, but also opens a possible vulnerability. To mitigate this, AdGuard keeps all this filtering on your computer and sends nothing to AdGuard. They also have a list of over 1,000 banks which they don't monitor at all, so your connection to your bank is probably unfiltered. However, they also offer the option to not filter any site with an EV certificate. EV certificates are much more expensive certificates which not only give you secure communications but also verify that the owner of the site is who they say they are. So they authenticate the identity of the website owner. All banks and large online retailers purchase these certificates. So, I enable this option to NOT filter anything from an EV certified site. Parental control: I do not mess with this. AdGuard places a small icon inside the browser window. You choose which corner to use. If everything isn't working perfectly, then you click that icon and make your adjustments. Clicking it yields this menu. You can turn off filtering for that site. Another excellent option is to turn off filtering for 30 seconds. I used this on two sites which used a pop-up or had a required tracker for me to login with. I wasn't getting the login screen, so I clicked Do not filtering for 30 seconds, and could login. Everything worked fine after that. Very cool. Another excellent option is to block a particular advertisement. One news site I go to has an aversive video advertisement in a section of their site that doesn't get blocked. 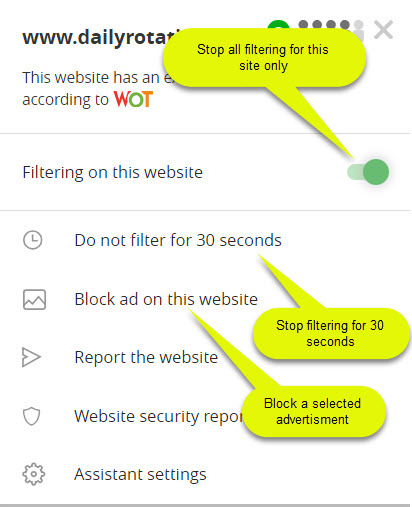 I chose the Block ad on this website and highlighted the ad to block. It was then added to my User Filter, and that spot is no longer showing that ad. AdGuard sends me notifications of the sites that have EV (extended validation) certificates and so do not get filtered for malware. About half of these are advertising from unvisited sites that is getting stuck into sites I visit. Most of the others are from sites (like Bloomberg) which do not have private information I'm concerned about. The notifications offer the option to filter in the future, which I accept. This allows me to easily add these sites to my filtered content even though they have an EV certificate. So, I start by excluding all EV certificate sites from scanning, then add in those I'd like to include in AdGuard monitoring. Because these are programmers, they use logic which is confusing for normal people. Clicking on the notification will offer to add that site to your exclusion list. Since you are excluding EV certificates, the exclusion list is who is excluded from the exclusion, meaning who is included in filtering. So, don't be confused, when you are adding the site to your exclusion list, you are including them in filtering by excluding them from not filtering. I think I emailed them and suggested clearer descriptions! The Website security report gives you a short report on the website from WOT, Yandex and Google. There are enough advantages over other ad-blockers for me to recommend AdGuard and I will continue to use it. Merging ad blocking, pop-up blocking and anti-tracking into a single program, simplifies protection. However, it requires some participation and configuration, so it is not a simple appliance.